Desulfobacca acetoxidans Elferink et al. 1999 is the type species of the genus Desulfobacca, which belongs to the family Syntrophaceae in the class Deltaproteobacteria. The species was first observed in a study on the competition of sulfate-reducers and acetoclastic methanogens for acetate in sludge. D. acetoxidans is considered to be the most abundant acetate-degrading sulfate reducer in sludge. It is of interest due to its isolated phylogenetic location in the 16S rRNA-based tree of life. 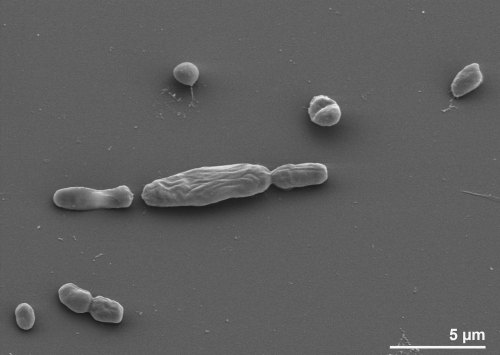 This is the second completed genome sequence of a member of the family Syntrophaceae to be published and only the third genome sequence from a member of the order Syntrophobacterales. 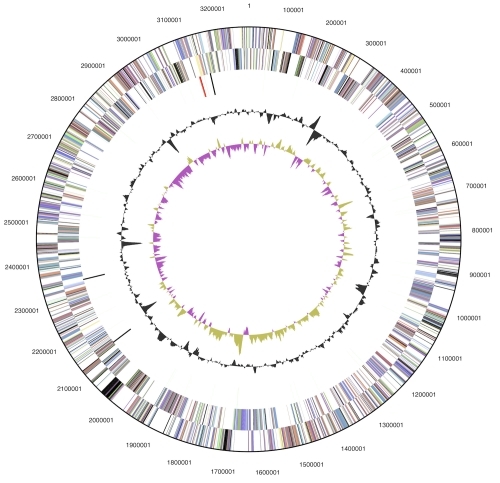 The 3,282,536 bp long genome with its 2,969 protein-coding and 54 RNA genes is a part of the Genomic Encyclopedia of Bacteria and Archaea project. Strain ASRB2T (= DSM 11109 = ATCC 700848) is the type strain of the species Desulfobacca acetoxidans, which is the type and sole species of its genus Desulfobacca . The type strain was isolated from granular sludge of a laboratory-scale upflow anaerobic sludge bed (UASB) reactor fed with acetate and sulfate . The generic name derives from the Neo-Latin word ‘desulfo’, meaning desulfuricating, and the Latin word ‘bacca’, berry, especially olive, meaning a sulfate-reducing olive-shaped bacterium. The species epithet is derived from the Neo-Latin words ‘acetum’, vinegar, and ‘oxido’, meaning acetate-oxidizing. The strain is important for the understanding of the competition for acetate between sulfate-reducers and acetoclastic methanogens in sludge . Here we present a summary classification and a set of features for D. acetoxidans strain ASRB2T, together with the description of the complete genomic sequencing and annotation. The single genomic 16S rRNA sequence of D. acetoxidans DSM ASRB2T was compared using NCBI BLAST [2,3] under default settings (e.g., considering only the high-scoring segment pairs (HSPs) from the best 250 hits) with the most recent release of the Greengenes database  and the relative frequencies of taxa and keywords (reduced to their stem ) were determined, weighted by BLAST scores. The most frequently occurring genera were Desulfobacca (74.9%) and Desulfomonile (25.1%) (4 hits in total). Regarding the two hits to sequences from members of the species, the average identity within HSPs was 98.9%, whereas the average coverage by HSPs was 96.7%. Among all other species, the one yielding the highest score was Desulfomonile limimaris (NR_025079), which corresponded to an identity of 90.4% and an HSP coverage of 49.8%. (Note that the Greengenes database uses the INSDC (= EMBL/NCBI/DDBJ) annotation, which is not an authoritative source for nomenclature or classification.) The highest-scoring environmental sequence was AY340836 ('sulfate-reducing fluidized-bed reactor clone SR FBR L13'), which showed an identity of 99.8% and an HSP coverage of 93.0%. The most frequently occurring keywords within the labels of environmental samples which yielded hits were 'sediment' (5.2%), 'microbi' (3.2%), 'lake' (1.9%), 'water' (1.7%) and 'depth' (1.6%) (246 hits in total). The most frequently occurring keywords within the labels of environmental samples which yielded hits of a higher score than the highest scoring species were 'sediment' (5.4%), 'microbi' (2.5%), 'lake' (2.1%), 'water' (1.9%) and 'contamin' (1.8%) (152 hits in total). These keywords reflect some of the ecological and properties reported for strain ASRB2T in the original description . 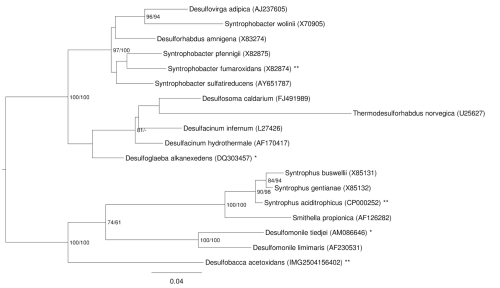 Phylogenetic tree highlighting the position of D. acetoxidans relative to the type strains of the other species within the order Syntrophobacterales. The tree was inferred from 1,457 aligned characters [6,7] of the 16S rRNA gene sequence under the maximum likelihood (ML) criterion . Rooting was done initially using the midpoint method  and then checked for its agreement with the current classification (Table 1). The branches are scaled in terms of the expected number of substitutions per site. Numbers adjacent to the branches are support values from 1,000 ML bootstrap replicates  (left) and from 1,000 maximum parsimony bootstrap replicates  (right) if larger than 60%. Lineages with type strain genome sequencing projects registered in GOLD  are labeled with one asterisk, those also listed as 'Complete and Published' with two asterisks (see  and CP000478 for Syntrophobacter fumaroxidans). Cells of strain ASRB2T are oval to rod-shaped with a size of 1.3 x 1.9-2.2 μm, appear singly or in pairs (Figure 2) and occasionally contain gas vacuoles in the late-exponential growth phase . The strain is non-motile, non-spore-forming and stains Gram-negative (Table 1) . Strain ASRB2T has a temperature range for growth between 27 and 47°C, with an optimum at 36-40°C . At the optimum growth temperature with acetate as sole carbon and energy source the shortest doubling time recorded was 1.7-2.2 days . Growth rate in brackish medium was significantly (4.8 x) slower, and no growth was observed in marine medium . The pH range for growth is 6.5-8.3, with an optimum of pH 7.1-7.5 . Desulfoviridin was not observed, but the c-type cytochromes were present . Sulfate or other inorganic sulfur components serve as electron acceptors via reduction to H2S . Strain ASRB2T degrades acetate (as the common carbon source and electron donor) completely to CO2 via the acetyl-CoA/CO-dehydrogenase pathway . The key enzyme of this pathway is encoded by the genes Desac_1965 – Desac_1969. Several more putative electron donors were tested but not found to be utilized by strain ASRB2T, such as: propionate, butyrate, lactate, H2/CO2, formate, ethanol, propanol, butanol, pyruvate, fumarate, glucose, crotonate, benzoate, phenol, aspartate and glutamate . Classification and general features of D. acetocidans ASRB2T according to the MIGS recommendations  and the NamesforLife database . No data on cell wall structure, quinones, fatty acid pattern or polar lipids are available for this strain. D. acetoxidans ASRB2T, DSM 11109, was grown anaerobically in DSMZ medium 728 (Desulfobacca medium)  at 37°C. DNA was isolated from 0.5-1 g of cell paste using Jetflex Genomic DNA Purification Kit (GENOMED 600100) following the standard protocol as recommended by the manufacturer, but with additional 2 hours incubation with 20 μl proteinase K at 58°C for cell lysis. DNA is available through the DNA Bank Network . The genome was sequenced using a combination of Illumina and 454 sequencing platforms. All general aspects of library construction and sequencing can be found at the JGI website . Pyrosequencing reads were assembled using the Newbler assembler (Roche). The initial Newbler assembly consisting of 66 contigs in one scaffold was converted into a phrap  assembly by making fake reads from the consensus, to collect the read pairs in the 454 paired end library. Illumina GAii sequencing data (1,042 Mb) was assembled with Velvet  and the consensus sequences were shredded into 1.5 kb overlapped fake reads and assembled together with the 454 data. The 454 draft assembly was based on 159.0 Mb 454 draft data and all of the 454 paired end data. Newbler parameters are -consed -a 50 -l 350 -g -m -ml 20. The Phred/Phrap/Consed software package  was used for sequence assembly and quality assessment in the subsequent finishing process. After the shotgun stage, reads were assembled with parallel phrap (High Performance Software, LLC). Possible mis-assemblies were corrected with gapResolution , Dupfinisher , or sequencing cloned bridging PCR fragments with subcloning. Gaps between contigs were closed by editing in Consed, by PCR and by Bubble PCR primer walks (J.-F. Chang, unpublished). A total of 55 additional reactions were necessary to close gaps and to raise the quality of the finished sequence. Illumina reads were also used to correct potential base errors and increase consensus quality using a software Polisher developed at JGI . The error rate of the completed genome sequence is less than 1 in 100,000. Together, the combination of the Illumina and 454 sequencing platforms provided 350.7 x coverage of the genome. The final assembly contained 346,781 pyrosequence and 28,710,424 Illumina reads. The genome consists of a 3,282,536 bp long chromosome with a 52.9% G+C content (Table 3 and Figure 3). Of the 3,023 genes predicted, 2,969 were protein-coding genes, and 54 RNAs; 103 pseudogenes were also identified. The majority of the protein-coding genes (68.2%) were assigned a putative function while the remaining ones were annotated as hypothetical proteins. The distribution of genes into COGs functional categories is presented in Table 4. We would like to gratefully acknowledge the help of Esther Schüler (DSMZ) for growing D. acetoxidans cultures. This work was performed under the auspices of the US Department of Energy Office of Science, Biological and Environmental Research Program, and by the University of California, Lawrence Berkeley National Laboratory under contract No. DE-AC02-05CH11231, Lawrence Livermore National Laboratory under Contract No. DE-AC52-07NA27344, and Los Alamos National Laboratory under contract No. DE-AC02-06NA25396, UT-Battelle, and Oak Ridge National Laboratory under contract DE-AC05-00OR22725, as well as German Research Foundation (DFG) INST 599/1-2. Kuever J, Rainey FA, Widdel F. Class IV. Deltaproteobacteria class. nov. In: Garrity GM, Brenner DJ, Krieg NR, Staley JT (eds), Bergey's Manual of Systematic Bacteriology, Second Edition, Volume 2, Part C, Springer, New York, 2005, p. 922. Kuever J, Rainey FA, Widdel F. Order VI. Syntrophobacterales ord. nov. In: Garrity GM, Brenner DJ, Krieg NR, Staley JT (eds), Bergey's Manual of Systematic Bacteriology, Second Edition, Volume 2, Part C, Springer, New York, 2005, p. 1021. Kuever J, Rainey FA, Widdel F. Family II. Syntrophaceae fam. nov. In: Garrity GM, Brenner DJ, Krieg NR, Staley JT (eds), Bergey's Manual of Systematic Bacteriology, Second Edition, Volume 2, Part C, Springer, New York, 2005, p. 1033. Han C, Chain P. 2006. Finishing repeat regions automatically with Dupfinisher. In: Proceeding of the 2006 international conference on bioinformatics & computational biology. Arabina HR, Valafar H (eds), CSREA Press. June 26-29, 2006: 141-146.